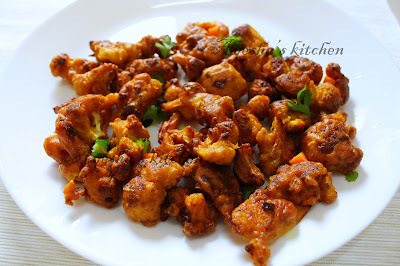 Some fried recipes for cauliflower need no more introduction. We can find lots of healthy cauliflower recipes too which tastes scrumptious. Such easy recipes are liked by both veggies and nonveggies equally. 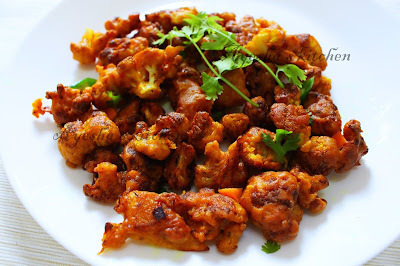 Here am sharing a cauliflower 65 / gobi 65 recipe. It is the best cauliflower recipe for kids. You can pack this fried crispy fried cauliflower 65 for their lunch box along with some steamed rice. Sure, they will enjoy eating such stuff. 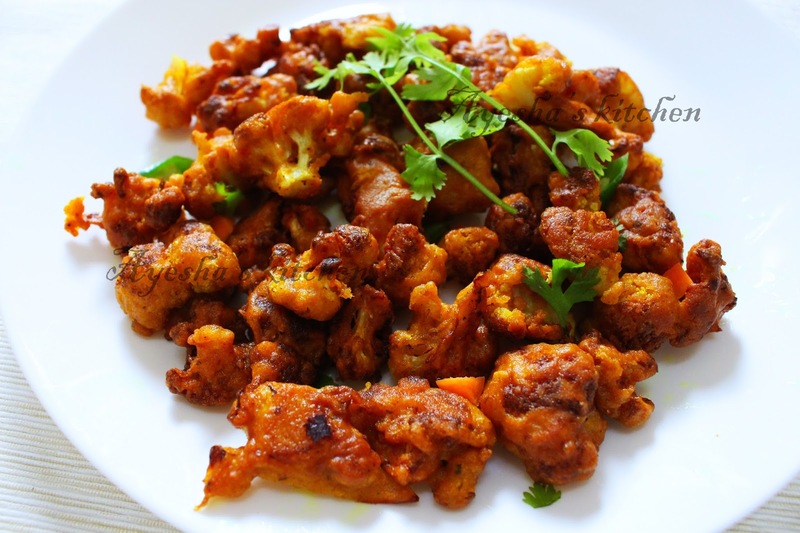 Hope you all love this recipe for cauliflower. Wash and clean the cauliflower properly, slice them into fine florets. In a bowl mix in turmeric powder, vinegar, red chili powder, rice powder, gram flour, ginger garlic paste, tomato sauce, white pepper powder (OPTIONAL) and salt. Make a very thick paste. Do not add more water and the consistency must be thicker than idli batter. Mix this thick batter with the sliced cauliflower/gobi florets very well. For best result, the gobi must be fully covered with this thick flour batter. Heat oil in a deep bottomed vessel and when hot, put curry leaves. Now drop the marinated cauliflower florets and deep fry. Check occasionally. Do not over fry the florets.